when i was considerably more of a youth than is presently the case, a young lady of my acquaint related a partial story regarding her sister who, as i recall, was studying to be a psychologist. the incident under discussion referred to an exam which the sister had recently undertaken as part of the course, and the seeming bizarreness of several of the questions after which the paper had enquired. at the time, and even now, i was sufficiently unaware of the female psyche to understand whether the mystique surrounding the revealing of this question was simply a ploy to make all seem considerably more enigmatic than was truthfully the case, or whether there exists an omerta preserving student/professor confidentiality. however, after considerable badgering on my part to have her reveal even one of the questions asked, i was informed in no uncertain times, that the passing on of this gem of information was thoroughly forbidden on pain of being sent to coventry during any subsequent attempted conversations. not being one for gossip or the passing on of secrets, i readily agreed. the second condition, at which point i was beginning to wonder just who it was that deserved the adjectival description of bizarre, was that, should i be unable to guess or ferret out the answer, it would not be given. the strange people that you meet. to bring my narrative to a more satisfactory level, let me avail you of the exam question itself; if this is the question, what is the answer?'. i made several guesses at the possible outcomes of which i could think, none of which were correct, though i'm sure there are many qualified psychologists out there grinning from ear to there at the recall of such a simple trial. no doubt steve peters has already moved onto bikeradar's pages by now. throughout my daily badgerings of prospective solutions, i was denied the correct response, until one day, out of desperation i proffered the answer 'if this is the answer, what is the question?'. that, apparently was exactly what would have set me on a career as a psychologist, despite my being none the wiser after the fact. a similar concept informs douglas adams' the hitch-hikers' guide to the galaxy, where a magnificent galactic experiment engendered by dolphins and mice into the meaning of life, the universe and everything, results in the number 42. the fact that no-one understands this answer gives cause to reconsider whether the correct question had been asked in the first place. it is a conundrum such as this that inhabits the world of road cycling, one that many of us rarely pause to consider until the blatant converse is graphically demonstrated. on the sunday ride only a week or two past, we were joined by a visiting cyclist who, by his own admission, was more regularly seen on a mountain bike rather than the skinny tyred machine on which he'd arrived. as we headed down the strand en route of coffee and cake, it was hard not to notice that, beneath his baggy shorts, were a pair of sturdy but hirsute calves. those beholden to the world of knobblies are all but oblivious to the art of leg shaving, yet it is a practice that harbours almost as many answers as the number of roadies who practice it. for instance, if the true purpose is really akin to a perceived aerodynamic advantage, why then do we not shave our forearms? and again, if it is to ease the applications of creams, bandages or other manner of medical dressings, the second question remains; why not shave the forearms? or head, for that matter? 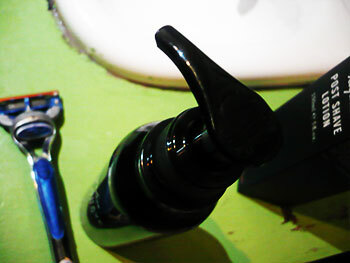 it's likely that each individual has their preferred situation for shaving; mine is ever in the bath, slathering on some rapha shaving cream before the application of those five gilette blades that would streamline me appropriately for an islay headwind. but, and it is a but worth emphasising, unless i replace the blades each and every time, eventually those five sharpened slivers of steel become dulled and scrape almost as much as they slice. and those smooth, yet athletic pistons do not like that at all. yet again, however, those fine fellows at perren street have a solution, and a rather aromatic one at that. 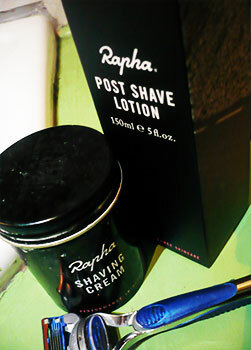 only recently released onto an unsuspecting, shaven-legged peloton is the latest in rapha's skin-care products in the shape of a post shave lotion enhanced with the usual herbs and plants from the ventoux as well as cocoa to inhibit hair regrowth and anti-ageing constituents. the latter may be more welcome on my face than legs, but at this stage, i'll take all the help i can get. 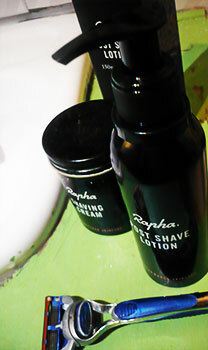 as far as using the lotion for facial shaving, i can think of no greater recommendation than the knowledge that rapha usa's chris distefano, a man who can attain a five o'clock shadow mere minutes after shaving, finds it much to his liking. 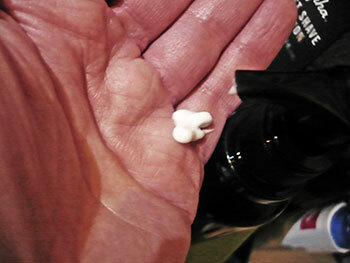 anything i can add by way of recommendation seems almost surplus to requirements, but it is worth emphasising that the lotion is not simply for legs. a small splodge in the palm of one hand can be rubbed into both before smothering the shaven visage to both sooth the furrowed chin and enhance once facial aroma with faint strains of the ventoux. yes, both we and rapha are inured to the vicissitudes of pain and suffering, but that doesn't mean we can't pamper ourselves when no-one's looking.